This is one complex flavor in a glass bottle. By far one of the most interesting, spicy root beers on the market. Our Virgil’s Root Beer review was a pleasure to the palate. Virgil’s root beer has an almost reddish tone to it. There are many various spices that combine to give this root beer its unique flavour. You can taste the quality of the ingredients in this micro brewed beverage. It has a strong licorice and anise smell. The flavor starts with a strong licorice flavour, and leaves a bit of a spicy hint of wintergreen and molasses. In all, this is a superior root beer with a unique complexity. While we certainly agree that this root beer is pure and rich, it didn’t seem creamy at all. Rather, Virgil’s Root Beer is a thinner, but more flavorful beverage than it is creamy. Made of all natural flavors, “Virgil’s (root beer) is a superb blend of spices & herbs gathered from the world over; Anise, Licorice, Vanilla (Bourbon), Cinnamon, Clove, Wintergreen, Sweet Birch, Molasses, Nutmeg, Pimento Berry Oil, Balsam Oil and Oil of Cassia. Gluten Free.” Micro Brewed with 100% natural ingredients imported from all corners of the world as it states on the bottles. Virgil’s Root Beer is made by Reed’s Inc. in LA, CA. You can purchase Virgil’s Root Beer Here. It was a pleasure to do this Virgil’s Root Beer Review. We rated it at 4.5 stars out of 5. 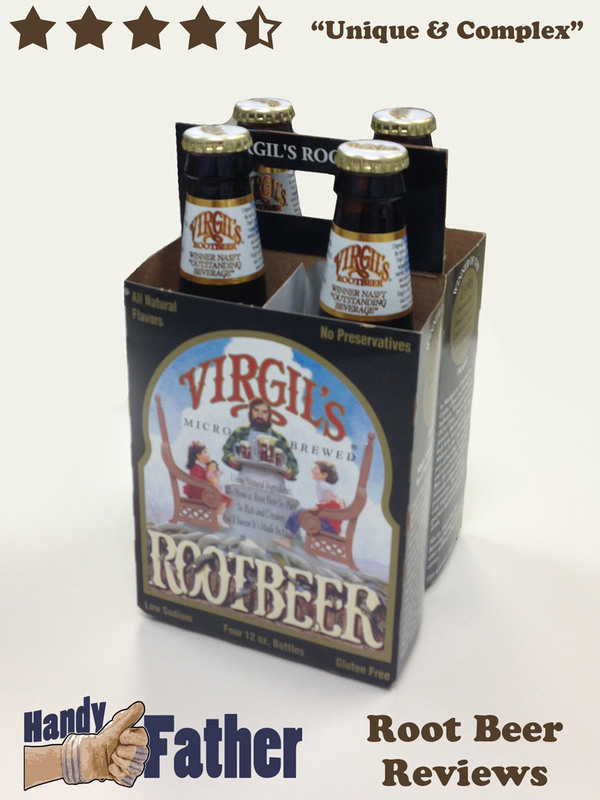 Do you have your own Virgil’s Root Beer Review to share? Please leave a comment below, and tell us what you think of this unique beverage. The team working on root beer reviews at Handy Father are three fathers with a passion for root beers. If you would like your favorite root beer reviewed, let us know what kind to try next. Woot Woot for Virgil's Root Beer!